As a frequent user of Stack Overflow, I see a lot of conversations that happen in comments. Whole questions are answered in the comments. Often, the comments have useful information, but ultimately, the comments generate a lot of noise. Too much noise for even the most dedicated of users to keep up with. No doubt, comments are useful at one point or another, but as time goes on, comments reach obsolescence. To date, we have not found a good way to handle this. Comments aren't moderated regularly by the people who post them. This is evident by the sheer number of comments that include clarification that is never edited into the question or the answer; or the number of times I've seen a user answer a question in a comment (I tried running SEDE queries for these to give you numbers, but it crashed Firefox each time). There are orders of magnitude difference between the users that flag comments for moderation, and the users that police their own comments. Lots of comments make the answers harder to follow, when the user has to scan through not only the answer, but its comments (and try to parse out the conversations from the relevant clarifications). This increases the friction for helping users find good answers. Lots of comments make the questions harder to follow, for the same reasons. If the OP doesn't edit their question, but instead posts comments with code or with clarifications, a user has to parse all those comments to determine if the problem is the same as theirs. This is only a problem for Stack Overflow, given we have over 111,127 posts that have more than 10 comments on them, and the next highest is Meta, with 5,936 posts with greater than 10 comments. Superuser jumps in at a paltry (by comparison) 2215. How do we solve this? Remember, we only have a dozen or so moderators on Stack Overflow. If we now only have a few hundred users that flag comments, there's no way we could expect 12 moderators to do better than a few hundred users. Is this even a problem? Should we even care about the number of comments? We know that comments are a necessary evil, but are we harming ourselves by allowing the number of comments to proliferate at an exponential rate, and never having an efficient means to prune them? Why should comments be a necessary evil? Is there a way we can better handle them so that they don't continue to grow hundreds of times faster than our ability to clean up the noise? As one of answerers points out, for non-moderators, you'll only notice this problem if you frequent questions where there are a lot of comments. Since that's only .8%, of the total number of questions, it's unlikely you'll see it as often as a moderator would (since we get a higher amount of flags on questions that are popular or have problems, which tend to attract more comments). As a moderator, I see a lot of flags from the system on long comment trains (20 or more comments in 3 days on a single post). Invariably, these comments contain clarifications that should be edited into their respective posts. Sometimes, these comments are even live debugging sessions. I can say that I spend enough time on this issue a day that it's getting to the point where I want to just shy away from the '20 or more comments in three days' flag, and not even pay attention to them. I believe that's the wrong answer. I know why it happens, it happens because there's generally so much noise mixed in with the gems (that nobody bothered to curate into the place it should be) that it's exhausting to try to sanely moderate comments. We tell people constantly that Stack Overflow is not a forum, it's a Q&A site. As a Q&A site, the focus is on asking Good questions and getting Good answers. If the answers aren't edited to include all information from the clarifications issued in the comments, then they aren't Good answers, are they? Likewise, if the question doesn't include all the relevant information, then it's not as helpful as it could be. If Stack Overflow is not a forum, then shouldn't we treat comments like something that should be cleaned up regularly, to maintain the quality of the content on the site? What I'm looking for are answers to help us solve this problem, or cogent arguments as to why these points are irrelevant, or not a problem. Possible answers include: Better badges for cleaning up comments, warning Posters to edit their post instead of posting code / clarifications in comments, better handling of conversations between users (pushing those to chat), etc. The queue should show the question and all its comments, highlighting the flagged ones, to make it easy to "agree to delete" many comments at a time, yet also easy to copy and paste the comments if you wanted to edit them into the question. Something like you see all the comments at once (whether flagged or not, perhaps the flagged ones have a button to vote-to-delete) and then you go down the list skipping the ones you want to keep and clicking delete on the ones that should go, and then click I'm done. I understand that comment deletion cannot be undone. But that is true whether a moderator does it or a group of 10Ks does. And comments are designed to be ephemeral. If there really is a problem, let's get it tackled. I suspect this queue would spend most of its time empty, like all the queues except Close Votes. Badges for flagging a thousand comments (and loss of flagging privileges if the reviewers disagree with you) should ensure it continues to get new items added for review. Users need to be motivated in some way to remove their comments. I suspect a lot of people like to see their comments stick around for posterity, or even get some kicks out of them being upvoted (even though it gains them zero rep, and the only benefit of upvotes there is to get the Pundit badge - which doesn't get taken away, of course, if comments later get deleted). I think Bluefeet makes a great point though - even if I am motivated to remove my obsolete comments just out of sheer altruism, it is an inordinate amount of work to track down my comments that might be obsolete. First, I have to find them, then I have to go visit the post and see if they are, in fact, obsolete. I think it's a big mistake to assume that all comments can be unilaterally and automatically deleted after some amount of time. I can come up with many examples where a comment shouldn't be deleted just because it's old. Let's say UserX answers a question and says "You should do y and z, and use the foo for the buzz." I see the post, and upvote it because I agree with y and z, but since I know that foo has a bug that can cause problem P, I comment. The owner of the post doesn't agree, or hasn't come across the bug, or knows a workaround, or simply ignores my comment. We can't force the author to incorporate my observation into the post, and I am certainly not going to force my will by getting into an edit war with them. But unless I'm completely wrong, future readers are done a disservice if my comment simply expires and disappears. So my proposal is a mixture of things that have been suggested on this and your previous, not-as-well-received suggestion. It is clear that we need an easier way to purge comments without the aid of a moderator, and in fact some motivation to do so. So I think it would be useful to have a system whereby if I have commented on a post, and the owner has incorporated the suggestions I have made, he/she can mark my comment as addressed, and it can be deleted with one click when I agree. This absolves me from having to manually keep track of all my comments and monitor the posts for improvements, relying instead on the owner actively doing something as a result. To provide motivation, perhaps the owner or both receives +1 when the cleanup is complete (maximum of one time per post / user pair combination, and subject to caps similar to editing / voting / rep). It sounds complicated but it's really not - just have both users agree that the comment is no longer necessary. If they don't agree, then the comments stay (and perhaps they should). There are complications, e.g. in many cases it has taken me more than one comment to get my point across (I will clean that thread up in the short term, but for now I'm going to leave it as an example). In those cases the commenter will have the onus to clean up all of their portion of the thread and not just the one-click action initiated by the owner. A secondary suggestion is to leverage the existing comment flagging system. By reducing the number of "obsolete" flags needed to automatically delete posts, we can limit the moderator intervention needed in cleaning up comments. This is just missing the motivation part - perhaps a badge for [y] comments purged or, like I mentioned above, small amounts of rep similar to voting for flagging comments that end up being deleted. And as I clean up the comment thread on this very post, I am reminded of another significant barrier to cleaning up comments: the ridiculous 5-second throttling threshold for votes that delete comments. Five seconds isn't a long time until you try to delete, say, 12 comments. (The limit should remain for upvotes and flags, though.) If moderators want to make it easier for us to clean up comments so they don't have to, here is one easy thing you can fight for: remove the 5-second throttling limit only for self-delete votes. On its own, unlikely to have a substantial effect, but if you add motivation and remove this barrier, I can almost smell the comment removal from here. A large problem is that comments just don't get cleaned up. I don't think users (me included) appreciate how disposable comments are. The system also works against us in getting obsolete comments removed. Notify users when posts they comment on get edited. Clarification and correction comments then get an extra opportunity to be removed. Make the flagging more prominent. This is a rock and a hard place because we want comments to be less prominent, but meh. I've flagged 2000+ posts but 33 comments. Go figure. Expand Review History to give comment flags the same exposure that posts get. Comment flagging history get tucked away in the sidebar. If people don't see action being taken on their comment flags, they're less likely to use it. 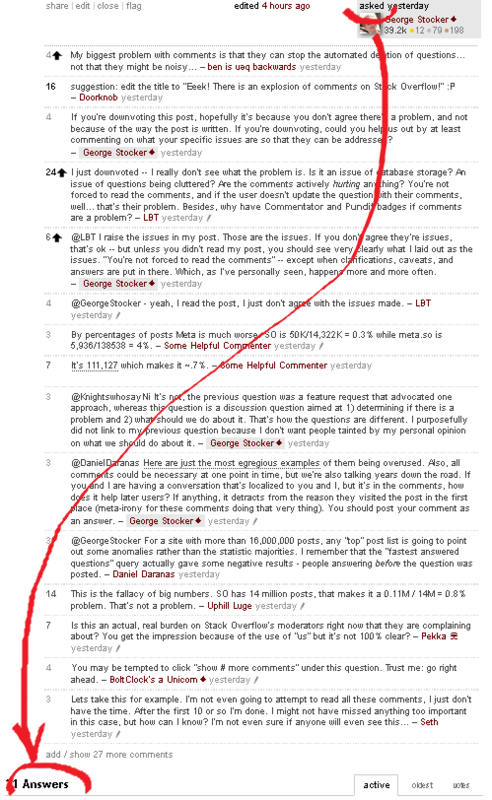 Radical idea; prevent the question OP from posting comments to their question. Comments on questions are asking for refinement or clarifications; this requires action by the OP in the form of updating their post, rather then answering back (or posting the answer in the comments). This won't work for answers, as comment streams about inaccuracies etc. are more common. I'd like to see a new action on comments of the form "this comment should be an answer", and another for "this comment should be an edit". Instead of telling moderators like a flag does, it would poke the commenter (and remind them that they should delete the comment afterwards). Maybe to deal with users who stopped coming, a certain number of pokes on a comment would add it to a review queue. The reviewer would be able to delete the comment after making the suggested edit or post. Currently, if I see a comment that should be an answer or edit, the only appropriate action I can take is to leave another comment suggesting the author writes it up. And if he does, I don't get notified about it, so now my comment is useless noise. There's been plenty of discussion and dozens of suggestions on how to make comments tidier / more limited / self-cleaning / auto-expiring. The option of hiding non-upvoted comments after 30 days has even been brought into play by Jeff himself if I remember correctly, and I think that's the way it's showed to non-logged-in users already. No point collecting ideas again that won't be acted on anyway, and discussing the merits and problems of long comment threads - we've done that plenty of times and the result appears to have been "it's not big enough a problem that any change is needed". The problem has not changed fundamentally on our, the users' end - we've always had endless dicsussions in comments. It's just the number of questions with long comment threads that has grown, along with the overall number of questions, and that might have become a problem on the moderators' end. If that's the case and you guys are drowning in comment garbage, then make yourself heard and complain. As it stands, this looks like one moderator's take on the issue. That is of course incredibly valuable insight in itself, but do the other mods feel the same way? If they do, they should all chime in and say, "this needs to change." Why not emphasize that more clearly, and leave figuring out what needs to happen to the team. Otherwise the complaint will be watered down by just another round of well-meant ideas from us Meta users, and discussion that will lead nowhere. Rather than or in addition to a queue, flagged comments should appear highlighted (e.g. in red or yellow) to users with privileges to act on them. Unlike a queue this raises awareness of the fact that we ought to be cleaning up comments all the time, i.e. it advertises the feature. Probably want to allow an opt-out so your 3k or 10k or whatever users don't have their responsibility forced on them. This isn't a new solution proposal, and it's been bandied about for a bit. But it would use a feature already in place (for questions with 30+ answers) and I think it's a good and acceptable compromise. Basically, if a comment has a lot of upvotes (ie people think it's interesting) and the post is old it still shows, but if it's not interesting then all the comments are hidden and you have a nice clean look to questions and answers that aren't currently active. The comments won't go away, and will still be visible using the "show comments" link. See an example of how it works here. Per George's request, I'm going to try and expand on my downvote. First and foremost, I don't see what the problem with comments is. Well then, to me, it's probably a bad question, or started off as a bad question. But you can look through the comments and see how the question morphed into hopefully a good question. Are lingering comments really that big of an issue on the question, though? 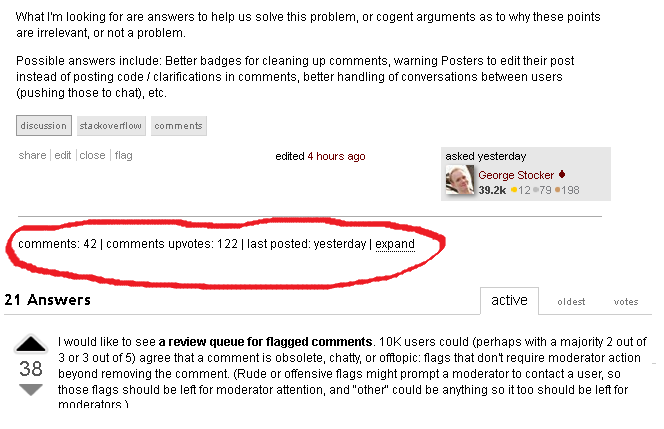 I've tried flagging comments for moderation attention, and I personally have 106 comments flagged, 46 deemed helpful. To me that seems like a dismally low rate. If comments are a probelm, don't reject the moderation flag. Ideally, in the early life of the question, there will be multiple people looking at the question. I would hope that if the OP puts their code in as a comment, someone else will instruct them to edit their question. Then, if the OP still doesn't do it, anyone still invested in the question can edit the comments into the question themselves. This one I will grant you, and I admittedly don't have a good response to this. Again, hopefully someone invested in the question will help clean up the answer, but in this case, I can't see how any sort of review queue would be helpful; at most, you would be just deleting comments, further muddying the answer. Finally, if comments are that big of a problem on SO, I think the Commentator (and possibly the Pundit) badges should be considered for removal. Don't reward people for leaving comments if comments are a problem, especially in the case of Pundit where you have to accumulate a number of high-voted comments. If it's truly that big of an issue, maybe give another badge for people deleting a certain number of their own comments (that have been around for a certain period of time, so they're not just commenting and then deleting), instead of trying to implement a review process. I rather people delete comments of their own accord then having others decide if the comment is worth it or not. Answers are the real unit of work in any Q&A system. I believe prevalence of answers is a fundamental principle of Stack Exchange, its cultural keystone. The problem is, the way how comments are presented now, jeopardizes above principles, it's that simple. Long comments threads make it harder to get to and read answers. Not just that but which is probably more dangerous, long comments threads make answers look less important. Assuming that comments tend to stick to popular, highly viewed posts, this may have substantial perception impact. Perception wise, a question with 100 comments and 2K views makes the same impact as 100 questions having 1 comment and 20 views. One way or another, there's the same 2000 views, with average ~50 comments shown per view. You may write 5, 10, 20 posts at SE blog stressing the importance of answers and ephemeral nature of comments, but until things are the way they are now, these will be easily outscored by hundreds of heavily commented posts with thousands views. You can try to auto-prune / flag / review comments deemed useless until the hell freezes over, but every single "useful" comment you decide to keep visible will serve as invitation to post 10 more comments. Let's face it, comments fit the "discussion forum" culture, and that culture is widely popular, fun, appealing and frankly speaking, much easier to follow than answer oriented one. Give it a chance to leak through and it will leak through, and it will compete and corrupt the answer oriented culture. It happens right now and to be honest, I find it is happening to me, all I write here is just how I feel. I think that if we want to consistently stick with "answers prevail" principles, the right way would be to always show comments condensed (well, almost always to be precise). For the sake of completeness, expanded view must always have "collapse" link to toggle view back to "canonical". Otherwise, inability to easy collapse back will punish users preferring to stick with answer-prevail attitude - the very audience who would support and enjoy the culture we are assumed to follow. Showing comments condensed, no matter useful or not, will help us keep the answer oriented culture. It's probably even more important to keep useful comments condensed. Useless comments are merely usability annoyance, these at least don't undermine importance of answers. Useful comments are more dangerous in that regard, as these tend to compete and even sometimes replace answers. Well, as long as comments are typically shown condensed, I don't think this will be much important. "Total collapse" will most likely be a huge culture shock for those used to see comments expanded (this certainly will be the case for me). Be prepared to deal with it. I'd go as far as suppose that without measures to tame mentioned shock, such a change is at high risk of rolling back. I would expect brute-force implementation to cause much turmoil, even more than massive and immediately visible deletes and review abuse caused in the recent past. One possible way to tame the shock could be to collapse comments only a day or two after the post creation (or after whatever is average period of active commenting on created posts). This will give users sedative feeling of being able to use comments in a familiar way, like nothing has changed. Another option I considered was to expand comments for a day or two each time post is edited or new comment is posted. That would be even more sedative, but unfortunately it would also open a gate for abuse: people would make senseless edits / comments with sole purpose to trigger expand. It is also worth noting that immediately condensing all the comments would likely be impractical, because this approach has been already tried in the past and turned out rather troublesome, see Comments: Top n Shown. Part of the problem is that people are used to the way forums work elsewhere on the web, and expect comments on stack exchange to work the same way. Rather than fighting that, let's make it work for us. One radical solution would be to track how and why comments are created and use that to suggest future behaviour. Rather than just having an add comment link at the end of the list of comments, also provide reply links to each individual comment. This would add a new comment after all others, just as we do now (we don't want to mess around with threading issues), but would store an in reply to reference (and possibly link/tool-tip to it). The first thing which this would do would be to allow you to tell the difference between a comment on the question (or answer) and a comment on another comment. The next thing it would do is provide a tree of links which the system could walk when the post or any comment within it is edited or deleted. This allows you to do things like notify all people who commented on a post when it is edited (as others here have suggested), but it would also allow you to exclude people who had commented on a comment rather than on the original post - reducing pressure on peoples Inbox. It also allows you to notify people when a comment they have replied to is deleted, prompting them to delete their reply (replies to deleted comments always look wrong, so this is a strong incentive to delete them, if you know about them). This would result in people being prompted to tidy up their comments both ways and the effect would ripple through the tree of comments. Comment posted by Bob asking for clarification. Comment posted by Alice providing the clarification. Comment posted by Bob suggesting the clarification be added to the question. Sometimes this process ends up with just 5 at the end of the exchange. Frequently though it sticks around as 23456 or if you are lucky 356 instead (where 6 prompted Bob to tidy up his comments). If 6 never gets posted, it's even more likely to stick around as 2345 forever, as Bob never gets informed that his comments may now be out of date. By prompting Bob when Alice edits the question (5), the final comment (6) may never even get written. By prompting Alice when Bob deletes 2 and/or 4, it is much more likely that 3 & 6 will get deleted. There are a certain class of comments that, while important, don't need to be seen by everyone. Generally, when you start to make those comments, you know that they don't need to be seen. That it's a conversation. So let us take comments to chat directly already! This has been asked for many times, and it would easily remove a lot of the chatter. We can usually tell when a comment is turning into a talky thread, long before the automated system does. So just let us do that. Give us the ability to just create a chat room for a question/answer. Just as if the "take it to chat" message popped up. While we certainly don't reach your levels of volume, Physics.SE has a high percentage of discussion-in-the-comments cases. So I see where you're coming from on this. Firstly, my personal philosophy on comments is the following: If it has little to no potential of improving the question, delete. This applies to chatty/useless comments, comments on posts where the author has declined fixing it according to the comment (this doesn't apply to "this post is wrong" comments, they are good guidance for future downvoters), and comments on old posts where the OP never came back. In the case of chatty comments, I sometimes give enough time for the OP to read them before deleting. Alright. If mods are being inundiated by chatty comment flags, then one solution would be to treat all comment flags as similar to spam/offensive flags, without the attached rep penalty. So, 6 comment flags delete the comment. Then, show these comments in the 10k queue. Incentivising comment flagging (making a successful comment flag count as 1/5th of a helpful flag for the badges) may also help get the comments cleaned up. Firstly, mods need a tool that lets them migrate selected comments to chat with little hassle. There have been cases when I've just been too lazy to do it(one has to quote all the comments in chat and then delete them) and I've asked the participants of the discussion to create a new chatroom if they wish to continue (with plans of coming back to clean up the comments once they finish). My guess is that the SO mods won't have the time to do this at all (as opposed to my laziness). If we want to battle these effectively, we need the tools for it. Secondly, we should show the "move to chat" option quite early in a discussion, preferably after it has reached the threshold where there are at least two comments from at least two users each. This button will delete all the comments of the participants, and leave behind "a discussion was [moved to chat] link". If a comment is unequivocally a reply to a user who is participating in the discussion, it goes to chat as well. It may be a good idea to scare people into moving to chat -- the move to chat link is summarily ignored by many. Something like "there's a chance this discussion will be deleted if it gets too long" may be enough. Even better, don't allow a discussion of more than X (X=10?) comments between two people. Disable the comment box and mention that it will be reenabled "if the side discussion is [moved to chat]"
Community flags could be tweaked to flag comment discussions of 10 comments instead of 20 (which could be easily dealt with if there were good tools for migrating discussions to chat). For answering in the comments, a flag and a corresponding "convert to answer" mod option ought to be sufficient. IMO, long discussions aren't that big a problem due to the collapsing. However, they do detract from more useful comments at times. And they add to clutter. It needs fixing, but wasting too much time doing so may not be the best idea. Currently, although it's officially frowned upon, the most useful way to add information in response to a comment is to add another comment. Take the example where I ask a question, and someone writes a comment, "Which platform?" If I update my question to add, "... on Ubuntu," the user who asked for that clarification won't find out about it. That means he won't answer the question, so I lose out, and that he won't see that his comment is now obsolete and delete it, so it stays for longer. OTOH, if I write that information in a comment, and @mention the commenter, he'll get notified, and will come back to make an answer and may delete his obsolete comment. When I'm responding to a comment, I know that if I edit my question/answer the commenter will be prompted to respond, so I'm encouraged to do that rather than leaving a further comment. When I'm posting a comment, I know that it will lead to notifications later - that is, it has a small inconvenience cost - so I'm only likely to make the comment if I'm actually interested in the question/answer being updated. When I'm returning to a question or answer I've commented on, if I'm happy with its current state, I'm more likely to delete my (now obsolete) comment so I don't get notified about it either more. There's a risk that people won't comment to ask clarification any more, because the cost of being notified is too great. If the change applies retroactively, then people who've been very active and not cleaned up their comments will suddenly start getting a lot of notifications. There's a risk they may simply start ignoring the notifications, or worse yet, removing all old comments indiscriminately. Grandfathering old comments would abate this risk. There's a risk of people leaving comments just so they can be notified about changes to a post. This would lead to more unnecessary comments, making the problem worse! You can already star a question to get notified of updates to it, but (AFAIK) there's no way to do this for answers. Adding something like a star for answers would reduce the risk. Overall, I think it'd be a positive change, and fits well with the SE mentality of making the system encourage the desired behaviour in its users. I completely agree with @Kate's suggestion for a review for flags. I think that would be helpful in getting the comments under control. Another suggestion which has been discussed before would be to allow the ability to search through comments, even our own comments. I would love to have the ability to go through my old comments and clean them out...but I have about 4700 comments and the current interface to review them is not particularly friendly. Even if this was limited to searching your own comments, it would at least give each user a way to clean up their old outdated noise from the site. Ideally, we could expand the searching on all comments to work hand and hand with a comment review queue. I agree with most of what the top-voted several answers have said with regard to reviewing and self-moderation of comments, but I'd also like to suggest a UI change to help keep Stack Overflow clean, as outlined in basic form in this Stack Snippet I threw together this afternoon. More details follow below. Note: You'll want to view the Stack Snippet in Full page mode. The trend is clear: humans like to talk about things. As time has gone on, the Stack Exchange team has gone to great lengths to increase the number of users on Stack Overflow (and other SE sites), often at the expense of perceived site/network quality (it's harder to train a herd than one person, after all). In response to this, one common trend I've seen is periodic, severe cracking down, often out of frustration, to try and keep the site clean and to keep quality high. This has been pretty much a losing battle, and it will only get worse, so long as the network continues to grow in users and activity. I know comments are ancillary to the main function of the network: asking good questions and receiving good answers. However, like the trend above, comments are only going to get worse/more plentiful (short of the Stack Exchange team simply disabling comments). Instead of continuing this losing battle and ultimately giving in to pressure later on (which I think is the inevitable course), we should embrace this fact of human nature and shift all comments to Wikipedia-style "discussion" boxes (a "page behind the page") each question and each answer. That way, comments and their detritus are hidden from the clean, Google-able Q&A view that we all know and love/hate, yet they have a happy, permanent home in which to live, and people interested in commenting can continue to do so without mucking up the Ive-esque interface that Stack Exchange dreams of. JSFiddle Example, for good measure. Would it make sense to have some comment flags jump the queue and get auto-processed? I mean, if three five different people flag a comment as "obsolete" or "not constructive / off topic", why should it wait for human intervention? Just remove it. Give 2k users the ability to vote to delete comments. 5 votes = comment is deleted. Added some code fragments. It's made of lots of files but hopefully I've included enough. @usernameredactedtoprotecttheinnocent - I've included the first few lines of the SVG file from which you'll see that there is no namespace set. Is that the problem? You can flag comments; if a comment is flagged enough times it can be auto deleted. The problem is that people only flag spam/offensive comments regularly; obsolete comments aren't flagged much, and virtually never enough to be deleted without moderator intervention. How about giving 1 rep per obsolete flag that results in a deleted comment (up to, say, 2 per day)? Some of these issues (like subjective posts) are already taken care of. One way to address some of the other issues could be to add a flag button (softer than the current one that requires moderator attention) for "the question needs editing", followed by a list of reasons. The flags would automatically be reset after the OP edits the question. If I had that flag button available, I could recommend that you revisit your post and present the stats as percentages. UI decisions should be made based on simplifying tasks that you want to encourage, so I suggest simplifying the process of incorporating a comment into a post. I suggest we add an option to flag to automatically include that comment in the post. Once either the original poster or someone with edit privileges selects that flag option, or a moderator approves a flag by a lower rep user, the comment is added at the bottom of the post below a HR or similar, perhaps with the note that it is a comment. I think it might be helpful to consider the different reasons for comments and to think about whether there might be "a better way" for some of those categories. From what I've seen, comments fall into some of the categories list below (I'm sure there are more). Perhaps these could be folded into a different comment system. Something only viewable by the OP and editors? Or at least, not part of the normal comment stream. This might remove a lot of the more revision-sensitive comments from public view. These are, in my opinion, the best kind of comment. They are often posted by experts who recognize the value of the answer but are aware of some unexpected pitfalls. These have helped me many times, but are all too rare (and often burried at the bottom with few upvotes). There might be some value in these being visible to other users (so they don't make the same mistake), but I think these are the most common to end up in chit-chat. Perhaps we can have a "vote history" where users have the option (not required) of posting a reason for their vote. I think these are the second best kind of comment. They don't deserve to be answers, but they do provide immense usefulness to the site. With some sort of voting mechanism in place, old comments could eventually be replaced by newer comments with more up-to-date info. I think in most cases these kinds of comments could be moved to chat. We could add a "reply" button which automatically redirects to the chat room (and invites the commenter to join). Get rid of the @user replies? They are handy, but encourage conversation between two users which often does not benefit the rest of the community. Most of these conversations could take place in the chat room. Users could vote (up and down) on the quality of the comment with the same ordering system as answers. Making comments non-linear may encourage users to move away from chit-chat. The votes don't necessarily need to affect rep - but it'll help good comments to float toward the top. Reading all of the answers here, and putting ideas together into a somewhat cohesive suggestion. Requesting clarification on a specific point. If the answer doesn't make sense, then it makes sense to have a place to talk about it. A place to post things that shouldn't be an answer, but might be useful still. "suggestion: edit the title to "Eeek! There is an explosion of comments on Stack Overflow!" :P – Doorknob May 15 at 13:13"
Helping a member understand things that are important/ not important. Often a specific point gets addressed via an edit, but the issue never gets resolved. Sometimes the comments turn in to an extended discussion. So, what can we do to help with the good, and remove the bad? And now, the proposed ideas. A comment review queue would be helpful as well. The general idea of 10K seems to be a good starting point. Ability to self-delete comments quicker than 5 seconds. Ability to reply to a comment. If the original comment is deleted, the entire thread will be deleted. Limit the number of comments shown to a fixed number, unless more requested. Only show the top view until more requested. When a comment with the word "Thank" is included (Thanks, Thank you, etc), then post a message saying "Accept/upvote this answer". Given these changes, there are some cultural changes that will be required. If replying to a quality of a question, the OP will have to delete the comment, closing an entire thread. A user can easily delete their own comments, allowing them to police them. The flagged comments will be spread across the user base, allowing the moderators to have a smidgen of a life. 24th answer: Isn't this somewhat anecdotic? Should we not rely on the community? Main point: comments are not the core of SO but they are useful. Proposal: Can't we just give 2/5/10k users additional rights and allow them to delete useless comments? This comment says that a link does not work (and proposes a different one) but the original link actually does work. Should we wait for five 2/5/10k users to get rid of that comment? Should we just say that it is the 2/5/10k user's word against the commenter's and be done with it? I would argue that (3) is good enough in 99% of those situations. A diligent user will probably even amend the post to add the second link. If you have the feeling that it opens the door to abuses for the other 1%, SO can send the original commenter a notification explaining the removal with a link to contest it with the moderators. Give 2/5/10k (probably 10) users "admin rights" on comments, enabling them to delete them when they add no value. It could be made more effective by communicating with the targeted users (2/5/10) that they have this additional right but that it comes with additional responsibilities, followed by examples of situations where they should / should not use that right. If you are a bit paranoid about this, you could give moderators access to deleted comments so that they can ascertain that deletions are acceptable and possibly suspend users from deleting if need be. Reduce the commenter's reputation by one point for each comment. Refund this point when the comment is deleted. Note that this does not deter asking questions for clarification, or for pointing out bad answers - at least, no more the extent to which downvotes suffer the same problem, and we all manage to get by with downvotes costing a rep point. What it does deter, is leaving comments that never, ever get cleaned up. And that's exactly what we should be deterring. If the poster never incorporates the comments into the answer, then the comment sticks around, and the rep point stays deducted. Which is analagous to what happens with downvotes now: if the answer is deleted, the rep point for downvoters is refunded. If the answer is not deleted, the rep point stays deducted. So again, the objection fails, because the rep-deduction on downvotes doesn't stop that system working; so there's no reason why it should stop comments working effectively, either. I would suggest implementing a voting system similar to the voting system for answers and posts (upvoting or downvoting). The default view for the end user should include the (x) best rated posts for the answer. Skew the score by the reputation of the voters to prevent abuse by bots. Comments can be constructive when they ask for clarifications of a question or answer. Such clarifications should then be edited into the question or answer. Ideally, that would happen, and then the comment should be flagged as outdated, and can be deleted. That's not happening at the moment, and we're left with a lot of clutter. So, I propose a sweeper bot that deletes all comments more than a month old. A month is more than enough time to enable a poster to update their post in light of the content of the comments. If it hasn't happened after a month, it's probably never going to happen. Any other content should either be edited into the answer, or provided as an alternate answer. Meta.SO does have an embedded culture of commenting. So comments are more highly valued here; but that's not necessarily representative of the whole Stack Exchange, nor of Stack Overflow. There would be a very very small amount of collateral damage. And there would be a huge amount of decluttering, making questions and good answers stand out much more.